Can cars push the most competitive genre in PC gaming forward? Any League of Legends devotee will tell you just how different Dota 2 is to it, and vice versa. But those differences are in the nuances as the broad strokes of any MOBA tend not to change. The genre is a peculiar beast, with an ebb and flow that is rarely meddled with for fear of breaking the formula. 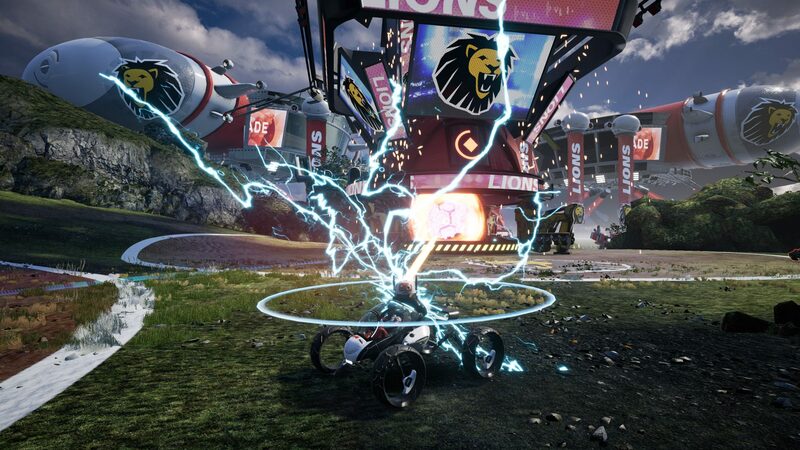 Lucid Games snapped the formula the moment it decided to build Switchblade around car combat. Once the engines started up, the particular pacing of the MOBA was thrown under the wheels, the game steering the genre towards something new and unrecognisable. Making Switchblade a success has been a matter of finding new balance in the vehicular arena. Working in Unreal Engine 4, Lucid has prototyped and polished its vehicular action into a fresh formula the studio is proud of. Lucid’s founders have a historied background of car games at Bizarre Creations. That studio may have been best known for the Project Gotham Racing series, but the Lucid team look back on Blur as Bizarre’s most forward-thinking release. Blur launched in 2010 with a power-up based combat system that came to life in the multiplayer Team Racing mode. Unreal Engine 4 comes with a visual scripting system called Blueprints that allows for quick prototyping. It’s proved the perfect match for Lucid’s development style. "The map is big, and it needs to be because you're driving vehicles around at very high speeds. But we also need to be able to break up the sight lines as well. That took a lot of experimentation, to get the right amount of space for the vehicles, but also create sight blockers and interest in the map." Switchblade was going to involve a huge amount of experimentation even without Lucid’s penchant for prototyping. 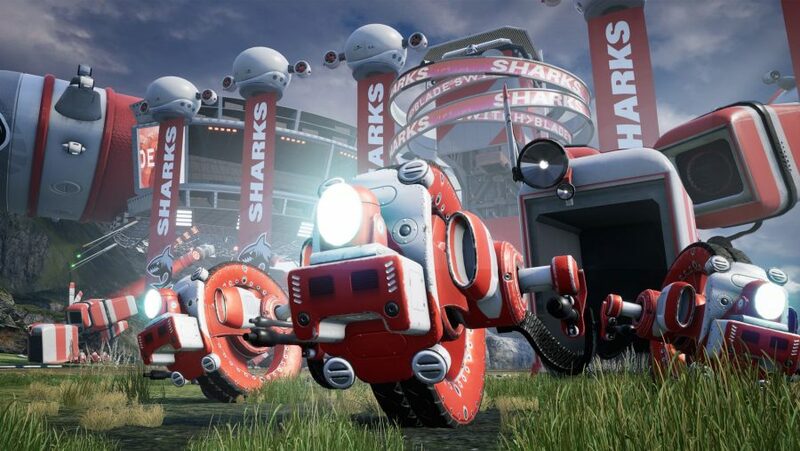 There’s no model to follow for a vehicular MOBA, where all the pieces on the board are in constant motion, so they had to reinvent the wheel… if you like. Instead, the Lucid team came up with ways to ensure the fight was always moving on and pushing forward. “We kind of turn it on its head,” Howard explains. “You can stop in the game, but it’s an absolute state of vulnerability. We established that and built a ruleset around it. It took a lot of lateral thinking and playtesting in the team. Switchblade’s team dynamics will be familiar to anyone who plays competitive multiplayer PC games – at the start of a match, comrades decide who’s going to go tank, for instance, and who’s going to heal. What changes this process up is the ability to switch vehicle at any time. Of course, the easiest thing to do would simply to have your previous vehicle disappear, and the new one spawn in on the spot. 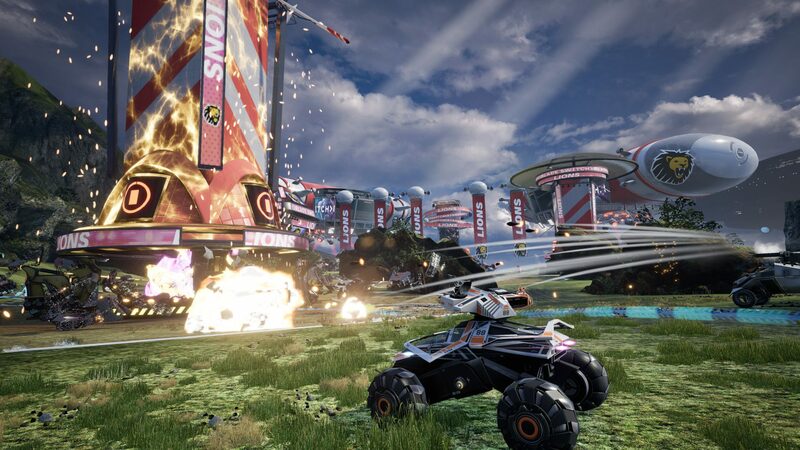 But it was important to Lucid that Switchblade’s gameplay be true to its future sport fiction. Besides, it gives you the chance to shoot a dropship down.